In the manufacturing of PCBs, we know that they are given copper finishes on their surface in order to protect them from environmental effects such as oxidation, humidity etc. If they are not given surface finishes, they can become unusable. It also provides a solderable surface onto which components can be assembled. HASL is one of the most common methods used in surface finishing. However with the passage of time, PCB pitches are becoming finer and therefore a thinner surface coat is required. Therefore, some alternatives to HASL are used such as electrolysis and immersion process. Here we will discuss some of the common surface finishes you will commonly see in PSB manufacturing, their advantages and downsides etc. HASL (hot air solder leveling) as mentioned before is the predominantly used method. 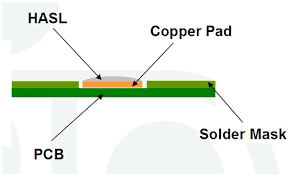 In this process the PCB is first dipped into a bath of molten solder so the entire exposed surface is covered and then the excess is removed by passing the PCB between hot air knives which blow hot air across the surface. One other advantage of using this method is that the high temperature (up to 265°C) used identifies any potential delamination errors before further processing of the PCB. 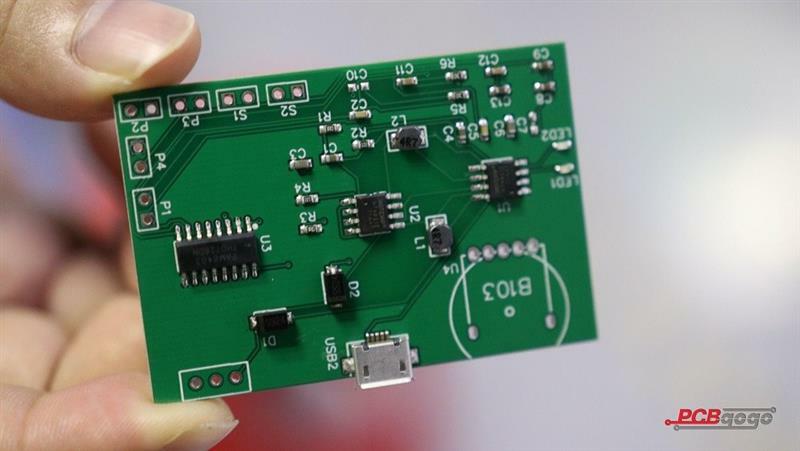 The other advantages include, low cost, this process is widely available, is re-workable, repairable and gives the PCB excellent shelf life However HASL might give your uneven surfaces, as mentioned before it is not suitable for finer pitch, it contains lead, thermal shock and solder bridging and it not good for PTH (plated through holes). Commonly referred to as white tin, Immersion tin is usually applied as a metallic finish deposited onto the PCB by a chemical displacement reaction. The ISn will also protect the PCB from environmental degradation such as oxidation. Copper andtin also show strong electron affinity. The metals will often diffuse into one another which will affect the performance of the PCB. ISn will give you a flat surface finish, is lead free, it is also re-workable and is one of the top choices for press fit pin insertion. This process is a conveyorized process which applies OSP (organic solderability preservative) in a thin layer onto the copper surface and protects it from oxidation. The organic compound used is water based and bonds to copper. 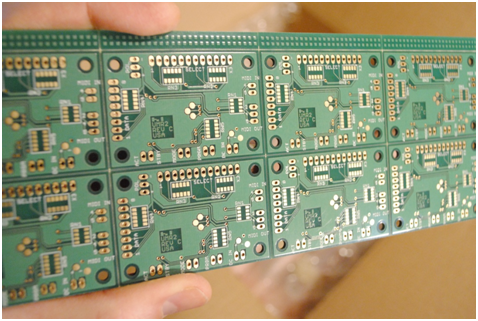 It will leave your PCB with a flat surface finish and it actually a simple process. It is also cost effective and re workable and does not use PB. It is also more environmentally friendly as compared to other lead free finishes. However, it has a downside to it too. You cannot, for example, measure the thickness, it is also not suitable for PTH, it has a short shelf life, and it can cause ICT issues. It can also be damaged so it must be handled carefully. ENIG is a two layered metallic coating. It consists of 2-8μin gold layer covering a 120-240 μin Ni layer. The gold protects the Ni during storage. This PCB surface finish type is the most used one in the entire industry because of its RoHS regulation. This finish will also leave your PCB with a flat surface and is suitable for PTH. It will also give your PCB a longer shelf life and is lead free. On the other hand if we look at its disadvantages, it is expensive, it is not re-workable, and it is a very complicated process. It can also suffer from signal loss and damage from electrical transmission. We divide electroplating nickel gold into ‘hard’ and ‘soft’ gold. We use hard gold in this electrolysis, which is plated over a coating of Ni. 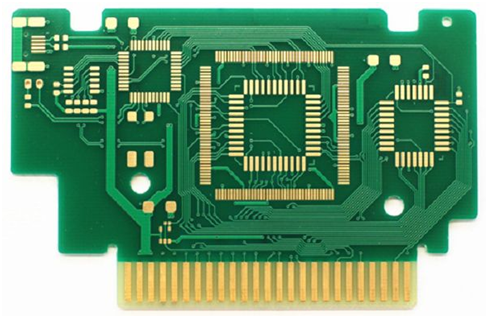 Hard gold is highly durable and is often used in the IC carrier boards and is used to add additional conductive trace to plating of finger area and keypads. The thickness can be controlled by varying the plating cycle duration. Hard gold is not applied to solderable area since it is expensive and has poor solderability. Hard gold will give you a hard, durable surface, it is lead free and will also give your PCB a long shelf life. On the downside it is expensive, requires extra labor, requires resist and plating, and is not solderable over 17 μin. Choosing the correct surface finish according to your project is important and there are a lot of factors to consider. You should always consult with your engineer prior to processing so you can select the correct options and your project may be cost-effective.